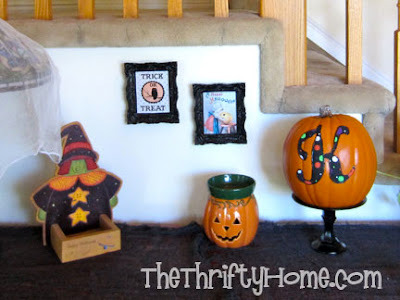 I didn't use to decorate very much for Halloween, but it has become my 5 year old son's favorite holiday and he has been begging me all year to make Halloween decorations. We had a lot of fun shopping and decorating together, making Halloween one of my new favorite holidays. 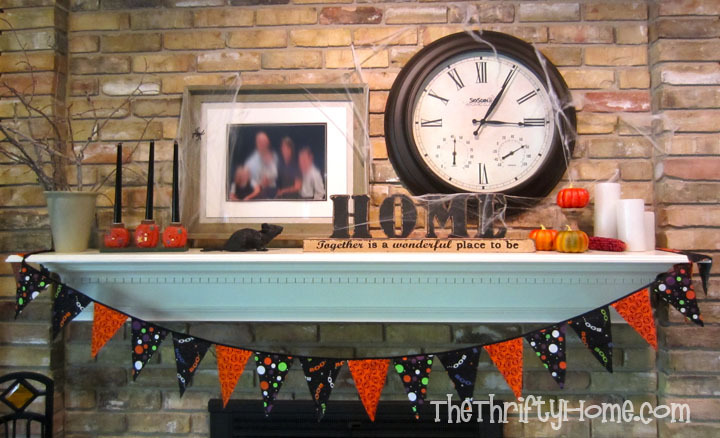 The rat and black candlesticks on the mantel are from the dollar store and I made the banner with fabric from Joann's Fabric. My son has been learning patterns in Kindergarten, so I had him lay out the pattern for the banner and used it as a teaching tool. These are the candlesticks I bought from the dollar store; I just spray painted them black. I found a tutorial for a felt bat garland on Pinterest and had my daughter make it. I have been teaching her how to sew, so this was a great project for her. 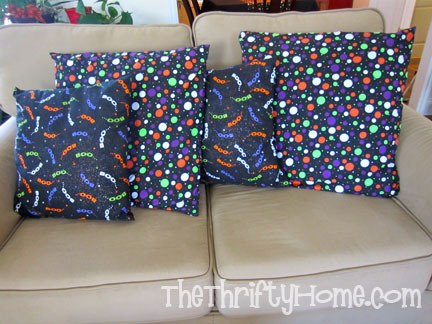 I sewed easy envelope pillow cases and slipped them over my existing pillows. 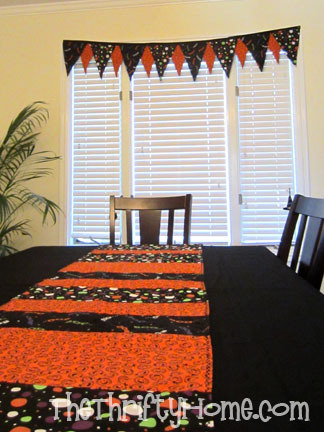 I used the rest of my fabric to make a table runner and banner for the dining room. 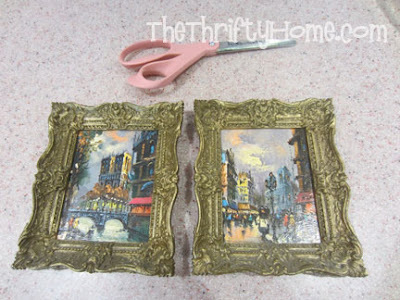 I found these frames at the thrift store and the candlestick holder and plate at the dollar store. I spray painted them black and used them in my entryway. The cost of all the supplies and fabric was under $40 (the fabric was most of the cost), but the fun I had with my kids was priceless. We love Halloween!!! 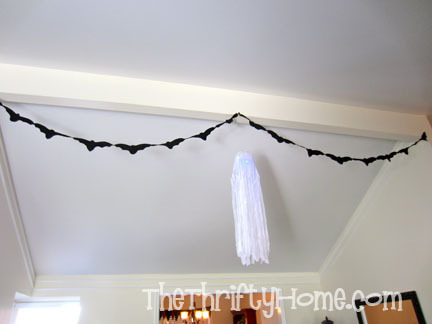 Nice job on the decor! 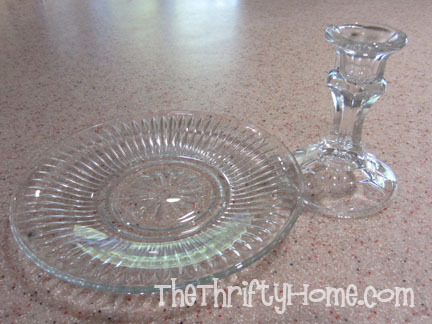 Did you use a special kind of spray paint on the glass candlesticks and glass paint? 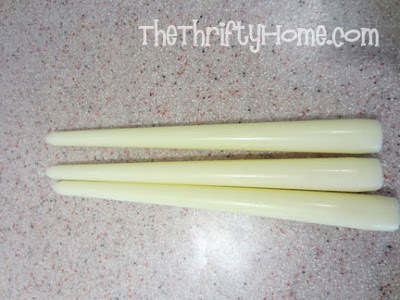 I have some of those candlesticks and have been wondering how to repurpose them!